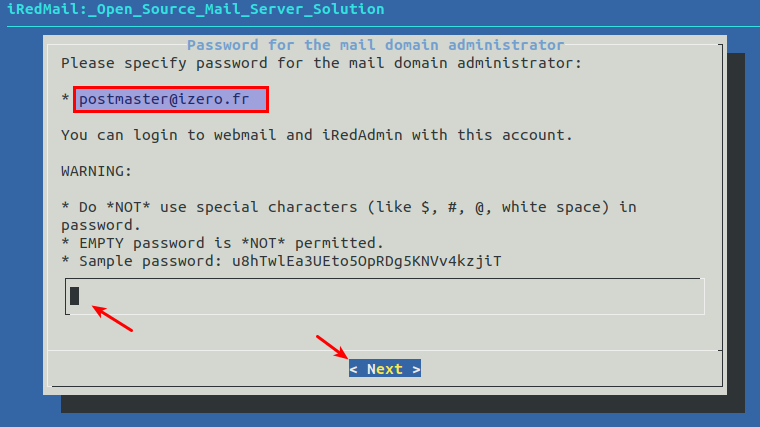 [Messagerie] Installation serveur de messagerie iRedMail - iZero - #! Faire les enregistrements A et MX chez le Registrar. izero.fr. 7184	IN	MX	10 mail.izero.fr. Séter le nom de la machine. Récupérer la source, dernière en date la 0.9.9 datant de décembre 2018 et dézipper la. 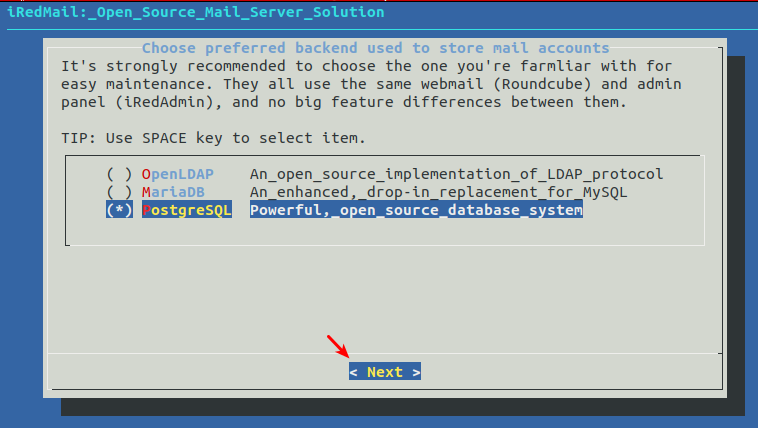 Ici il faudra choisir quel backend a utilisé pour les compte mails, s’appuyer sur un OpenLdap ou choisir un serveur de db. J’ai par habitude d’utiliser Postgresql, la proc LDAP est disponible sur le site officiel. Définir un mot de passe pour la db. Entrez le nom de domaine ou un sous-domaine en tant que premier nom de domaine virtuel différent du hostname. (uniquement le nom de domaine et non le nom de domaine complet du système). [ INFO ] Import apt key (0x810273C4) for SOGo repo (https://packages.inverse.ca). acl is already the newest version (2.2.52-3+b1). acl set to manually installed. cpio is already the newest version (2.11+dfsg-6). libsasl2-modules is already the newest version (2.1.27~101-g0780600+dfsg-3). libsasl2-modules set to manually installed. libmnl0 is already the newest version (1.0.4-2). python-lxml is already the newest version (3.7.1-1). python-lxml set to manually installed. p7zip-full is already the newest version (16.02+dfsg-3+deb9u1). p7zip-full set to manually installed. python-requests set to manually installed. unzip set to manually installed. bsdutils is already the newest version (1:2.29.2-1+deb9u1). libuuid1 is already the newest version (2.29.2-1+deb9u1). zlib1g is already the newest version (1:1.2.8.dfsg-5). curl is already the newest version (7.52.1-5+deb9u9). 0 upgraded, 200 newly installed, 0 to remove and 0 not upgraded. Need to get 110 MB of archives. After this operation, 377 MB of additional disk space will be used. Selecting previously unselected package gnustep-common. Selecting previously unselected package gnustep-base-common. Selecting previously unselected package libobjc4:amd64. Selecting previously unselected package libgnustep-base1.24. Selecting previously unselected package unar. Selecting previously unselected package postfix-sqlite. Selecting previously unselected package altermime. Selecting previously unselected package arj. Selecting previously unselected package clamav-base. Selecting previously unselected package libjson-c3:amd64. Selecting previously unselected package libtfm1:amd64. Selecting previously unselected package libclamav7:amd64. Selecting previously unselected package clamav-freshclam. Selecting previously unselected package clamav. Selecting previously unselected package clamav-daemon. Selecting previously unselected package clamdscan. Selecting previously unselected package librpmio3. Selecting previously unselected package debugedit. Selecting previously unselected package distro-info-data. Selecting previously unselected package dovecot-core. Selecting previously unselected package dovecot-imapd. Selecting previously unselected package dovecot-lmtpd. Selecting previously unselected package dovecot-sieve. Selecting previously unselected package dovecot-managesieved. Selecting previously unselected package dovecot-pgsql. Selecting previously unselected package dovecot-pop3d. Selecting previously unselected package gnustep-base-runtime. Selecting previously unselected package libobjc-6-dev:amd64. Selecting previously unselected package gobjc-6. Selecting previously unselected package gobjc. Selecting previously unselected package gnustep-make. Selecting previously unselected package libarchive-zip-perl. Selecting previously unselected package libberkeleydb-perl. Selecting previously unselected package libconvert-binhex-perl. Selecting previously unselected package libio-stringy-perl. Selecting previously unselected package libmime-tools-perl. Selecting previously unselected package libconvert-tnef-perl. Selecting previously unselected package libconvert-uulib-perl. Selecting previously unselected package libcrypt-openssl-bignum-perl. Selecting previously unselected package libcrypt-openssl-rsa-perl. Selecting previously unselected package libdbd-pg-perl. Selecting previously unselected package libdigest-hmac-perl. Selecting previously unselected package libio-multiplex-perl. Selecting previously unselected package libxmlsec1. Selecting previously unselected package libxmlsec1-openssl. Selecting previously unselected package liblasso3. Selecting previously unselected package libnet-ip-perl. Selecting previously unselected package libnet-dns-perl. Selecting previously unselected package libmail-dkim-perl. Selecting previously unselected package libnetaddr-ip-perl. Selecting previously unselected package libmail-spf-perl. Selecting previously unselected package libmatheval1:amd64. Selecting previously unselected package libnet-cidr-lite-perl. Selecting previously unselected package libnet-cidr-perl. Selecting previously unselected package libnet-libidn-perl. Selecting previously unselected package libnet-patricia-perl. 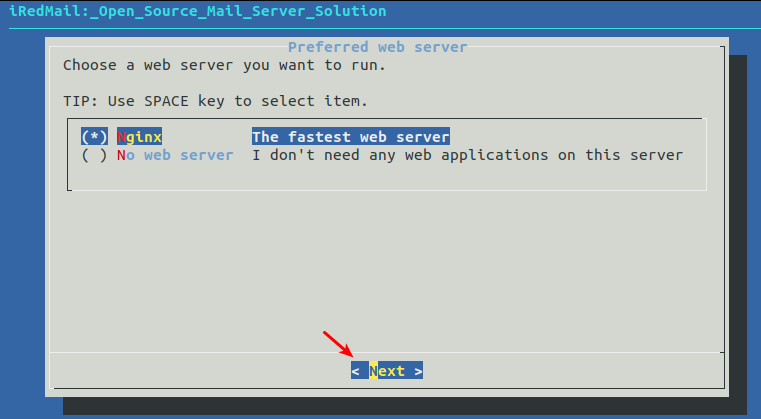 Selecting previously unselected package libnet-server-perl. Selecting previously unselected package nginx-common. Selecting previously unselected package libnginx-mod-http-auth-pam. Selecting previously unselected package libnginx-mod-http-dav-ext. Selecting previously unselected package libnginx-mod-http-echo. Selecting previously unselected package libnginx-mod-http-geoip. Selecting previously unselected package libnginx-mod-http-image-filter. Selecting previously unselected package libnginx-mod-http-subs-filter. Selecting previously unselected package libnginx-mod-http-upstream-fair. Selecting previously unselected package libnginx-mod-http-xslt-filter. 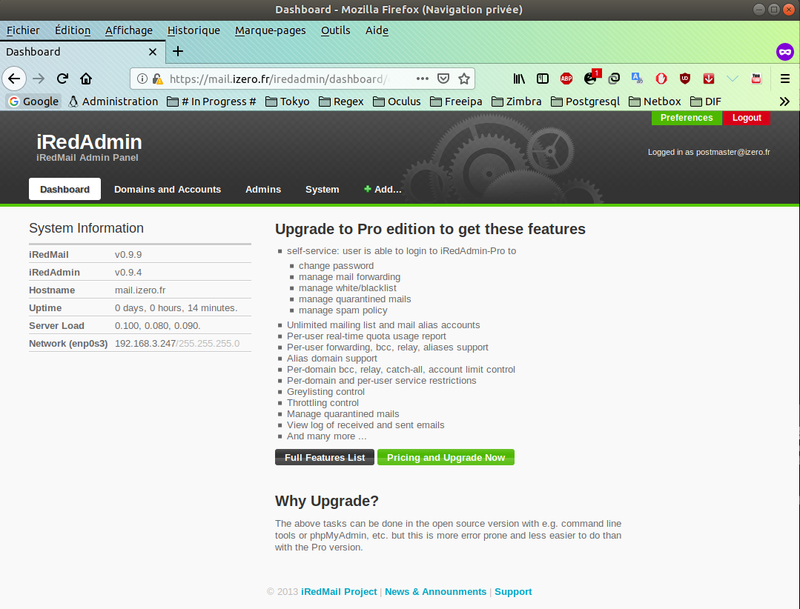 Selecting previously unselected package libnginx-mod-mail. Selecting previously unselected package libnginx-mod-stream. Selecting previously unselected package librpm3. Selecting previously unselected package librpmbuild3. Selecting previously unselected package librpmsign3. Selecting previously unselected package libsys-cpu-perl. Selecting previously unselected package libsys-meminfo-perl. Selecting previously unselected package libunix-syslog-perl. Selecting previously unselected package libwbxml2-0. Selecting previously unselected package logwatch. Selecting previously unselected package lrzip. Selecting previously unselected package lzop. Selecting previously unselected package mcrypt. Selecting previously unselected package mlmmj. Selecting previously unselected package nomarch. Selecting previously unselected package pax. Selecting previously unselected package php-cli. Selecting previously unselected package php-curl. Selecting previously unselected package php7.0-fpm. Selecting previously unselected package php-fpm. Selecting previously unselected package php-gd. Selecting previously unselected package php-intl. Selecting previously unselected package php-json. Selecting previously unselected package php-mbstring. Selecting previously unselected package php-mcrypt. Selecting previously unselected package php-pgsql. Selecting previously unselected package postgresql-client. Selecting previously unselected package postgresql-contrib. Selecting previously unselected package python-beautifulsoup. Selecting previously unselected package python-cheetah. Selecting previously unselected package python-flup. Selecting previously unselected package python-netifaces. Selecting previously unselected package python-pycurl. Selecting previously unselected package python-sqlalchemy. Selecting previously unselected package python-sqlalchemy-ext. Selecting previously unselected package python-webpy. Selecting previously unselected package python3-pyinotify. Selecting previously unselected package python3-systemd. Selecting previously unselected package re2c. Selecting previously unselected package ripole. Selecting previously unselected package rpm-common. Selecting previously unselected package rpm2cpio. Selecting previously unselected package rpm. Selecting previously unselected package spamassassin. Selecting previously unselected package sa-compile. Selecting previously unselected package libsbjson2.3. Selecting previously unselected package libsope-xml4.9. Selecting previously unselected package libsope-core4.9. Selecting previously unselected package libsope-mime4.9. Selecting previously unselected package libsope-appserver4.9. Selecting previously unselected package libsope-gdl1-4.9. Selecting previously unselected package libsope-ldap4.9. Selecting previously unselected package sope4.9-libxmlsaxdriver. Selecting previously unselected package sope4.9-gdl1-postgresql. Selecting previously unselected package sogo. Selecting previously unselected package spamc. Selecting previously unselected package tofrodos. Selecting previously unselected package unrar-free. Selecting previously unselected package uwsgi-core. Selecting previously unselected package uwsgi. Selecting previously unselected package whois. Selecting previously unselected package amavisd-new. Selecting previously unselected package liblz4-tool. Selecting previously unselected package lm-sensors. Selecting previously unselected package postfix-pcre. 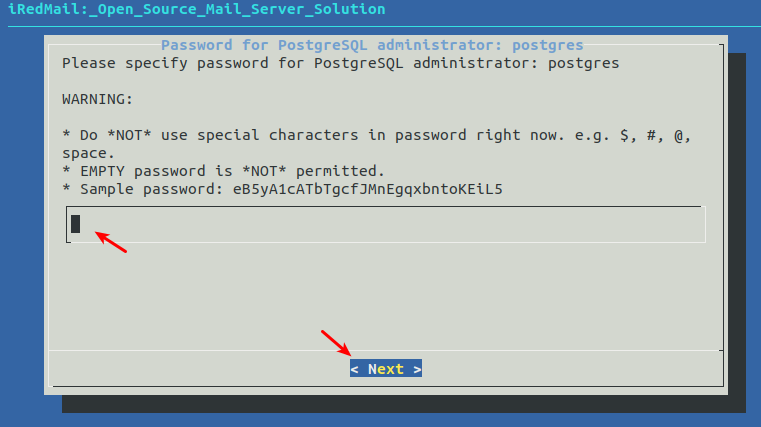 Selecting previously unselected package postfix-pgsql. Selecting previously unselected package sogo-activesync. Selecting previously unselected package uwsgi-plugin-python. Created symlink /etc/systemd/system/multi-user.target.wants/dovecot.service -> /lib/systemd/system/dovecot.service. Created symlink /etc/systemd/system/multi-user.target.wants/fail2ban.service -> /lib/systemd/system/fail2ban.service. Created symlink /etc/systemd/system/multi-user.target.wants/memcached.service -> /lib/systemd/system/memcached.service. Created symlink /etc/systemd/system/multi-user.target.wants/lm-sensors.service -> /lib/systemd/system/lm-sensors.service. Created symlink /etc/systemd/system/multi-user.target.wants/postgresql.service -> /lib/systemd/system/postgresql.service. Created symlink /etc/systemd/system/multi-user.target.wants/postfix.service -> /lib/systemd/system/postfix.service. Postfix configuration values, see postconf(1). After modifying main.cf, be sure to run 'service postfix reload'. Created symlink /etc/systemd/system/multi-user.target.wants/clamav-freshclam.service -> /lib/systemd/system/clamav-freshclam.service. Created symlink /etc/systemd/system/multi-user.target.wants/clamav-daemon.service -> /lib/systemd/system/clamav-daemon.service. Not creating home directory `/var/lib/spamassassin'. 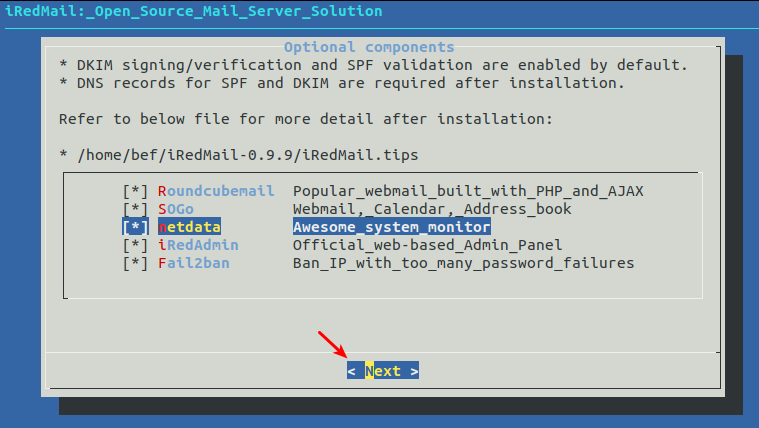 inside /usr/share/doc/sogo/ and apply them if needed. [ INFO ] Generate self-signed SSL cert (2048 bits, expire in 10 years). [ INFO ] Create required system accounts. 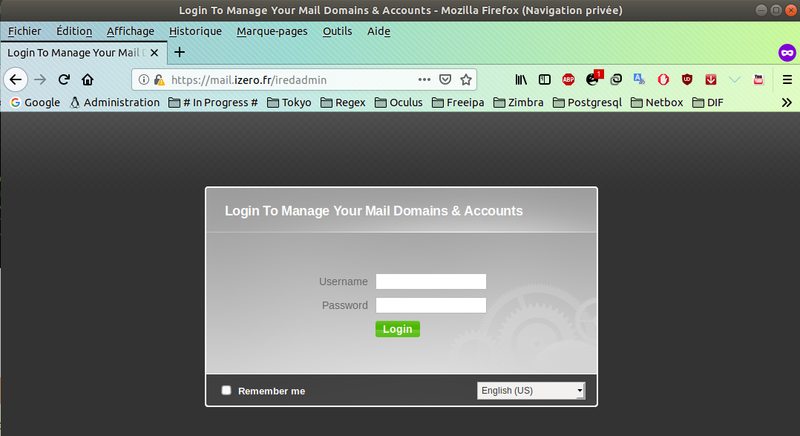 [ INFO ] Configure Nginx web server. 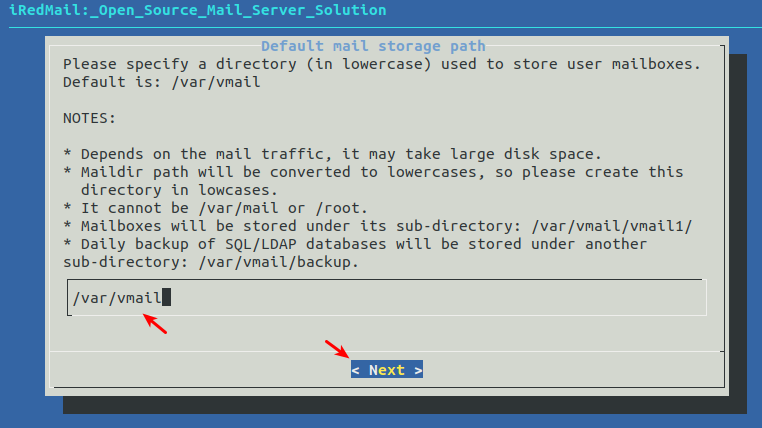 [ INFO ] Configure PostgreSQL database server. 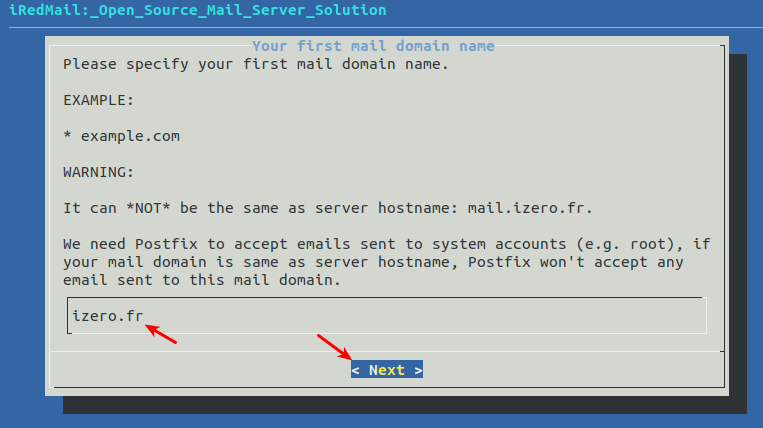 [ INFO ] Configure mlmmj (mailing list manager). 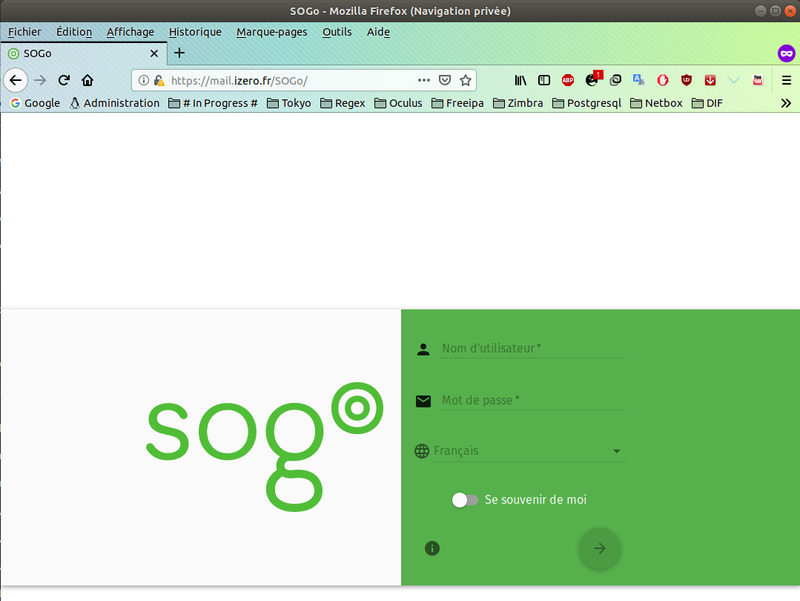 [ INFO ] Configure SOGo Groupware (Webmail, Calendar, Address Book, ActiveSync). 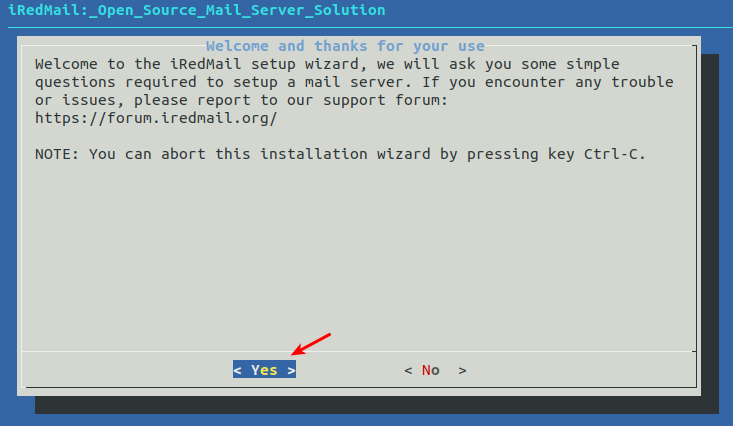 * iRedMail-0.9.9 installation and configuration complete. 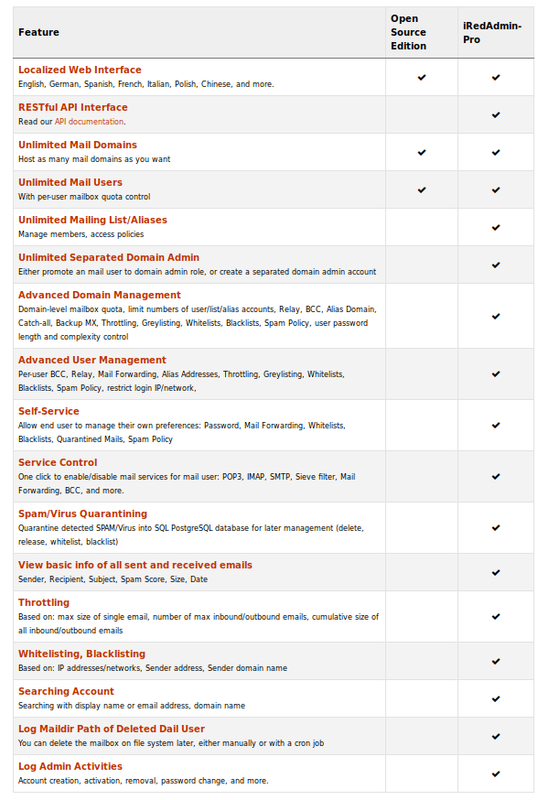 < Question > Would you like to use firewall rules provided by iRedMail? [ INFO ] Copy firewall sample rules: /etc/default/iptables. * And it's sent to your mail account postmaster@izero.fr. 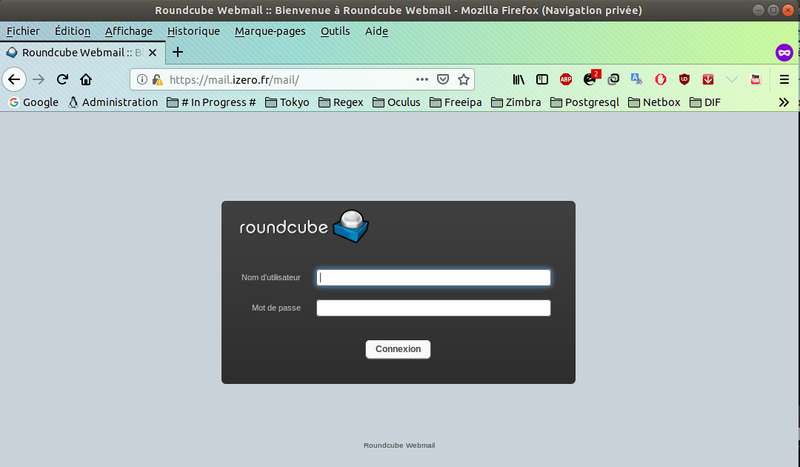 Après le reboot du système, lancer un navigateur web et taper l’url du serveur pour accéder au Webmail. 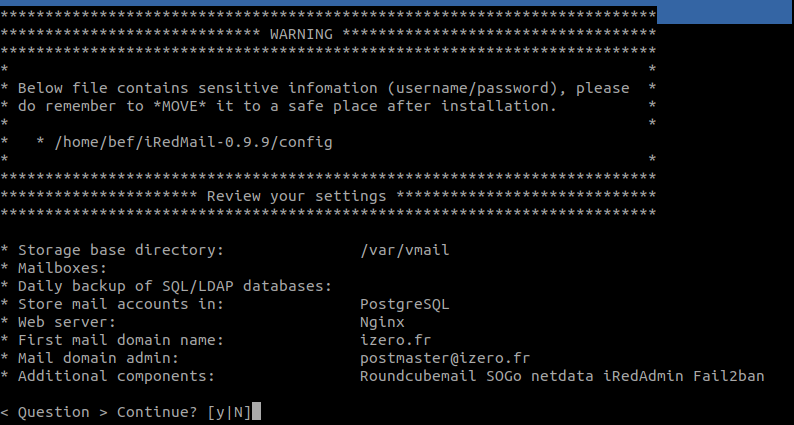 Le fichier qui se trouve dans le répertoire iRedMail-0.9.9/iRedMail.tips est généré a la fin de l’installation.